Will Cisco Systems Raise Its Dividend in 2017? The networking giant has the highest yield of any Dow tech stock. Will Cisco keep boosting its payout? Technology stocks used to be stingy with their capital, but Cisco Systems (NASDAQ:CSCO) is proof of how much the tech industry has changed when it comes to dividends. Cisco paid its first dividend just six years ago, but since then, it has grown its quarterly payment so much that the networking giant is now among the top dividend paying stocks in the Dow Jones Industrials in terms of yield. Looking forward, income investors want to know if they can count on Cisco to continue its streak of rewarding shareholders with higher dividends. Let's take a closer look at Cisco Systems to see whether it will raise its dividend in 2017. Cisco's history of paying dividends is short but sweet. In 2011, the networking giant declared a $0.06-per-share quarterly dividend. Then-CFO Frank Calderoni told investors, "Cisco's leadership position in the markets we serve is strong, and the time is right for Cisco to pay our first-ever cash dividend." The payout gave Cisco a modest dividend yield at the time of 1.4%. Yet Cisco wasn't content for very long with simply paying a dividend. The following year, the company gave investors a 33% increase in April, and then came back with a whopping 75% boost in October. The second increase was part of Cisco's broader capital management strategy, which stated the company's intention to return half of its free cash flow to shareholders in the form of dividends and stock repurchases combined. Moreover, then-CEO John Chambers said, "We wanted to get the dividend to allow both that the shareholders clearly understood we're committed to it, and if we do our job right, at the right times, we're committed to raising it." CSCO dividend data by YCharts. Since then, Cisco has followed through on its commitment to make the dividend an increasingly important part of its total return for shareholders. Three double-digit percentage dividend hikes followed in consecutive years, and the most recent increase came to 24%. Current CEO Chuck Robbins told investors after that boost, "We have a tremendous amount of confidence in our business long term, [and] we heard from many of our shareholders that they wanted to see us get more aggressive with the dividend returns." Yet even with the big increases in dividends, Cisco hasn't overextended itself. Dividend payouts make up just over half of Cisco's earnings right now. If the company can sustain its growth rates going forward, then there should be more opportunities for the networking giant to make further increases. 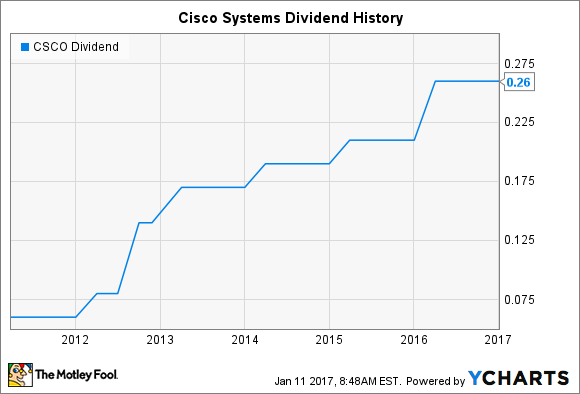 Will Cisco raise its dividend in 2017? One outstanding issue that could spur another increase in Cisco's capital return to shareholders is whether tax reform will reduce the amount of tax that the tech giant would have to pay to repatriate profits from overseas. As Robbins told investors in December, "If we're able to bring those funds back to the U.S., then we would look at a combination of the options of dividends, buybacks, and M&A activity." Yet it wouldn't take favorable movement on repatriation to allow Cisco to make a further increase. Stock buybacks have reduced Cisco's share count over the years, and that permits the company to make dividend increases without boosting the total amount of cash it's paying to shareholders. Overall, the odds are good that Cisco will raise its dividend in 2017. There's a chance that the company could wait until later in the year than its usual March-April time frame in order to give lawmakers time to consider a tax reform package that could include repatriation provisions. However, what's more likely is that investors will get a roughly 12% increase to $0.29 per share early in the year, with a possible further increase if things in Washington go well. Regardless, Cisco's total return of nearly 25% over the past year has kept long-term shareholders happy, and its growth prospects remain solid, offering future support for future dividend increases in 2017 and beyond.